When I first got my real estate license, it was a total shock to me that I didn’t have any business. I would show up to the office every single day trying to learn as much as I could in hopes of soon making the big bucks. One day, I was sitting at my desk browsing the internet looking for an apartment for myself. Getting started in real estate cost me more money than I thought and I could barely afford anything so I needed to move. I stumbled upon many rental websites and some of them offering really nice deals just for using their service. I began to get curious. Next, think you know, I started seeing more and more ads for rental services. Seeing those got me questioning. I wondered how these companies made money. I stopped searching for myself and decided to start searching for the secret to these rental companies. I quickly found out that they were just real estate agents and that I could do the same thing. I set out on a mission trying to figure it out. It took me a while but I did figure it out and I became really good at making money with rentals. 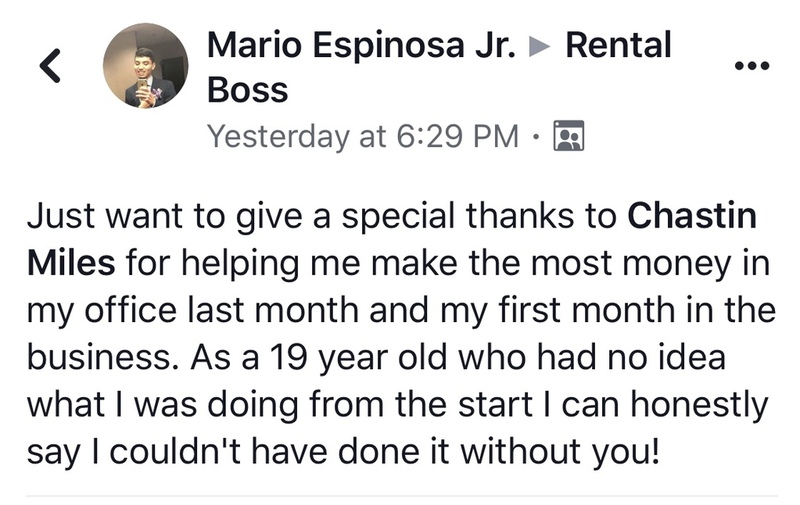 When I started helping people with rentals, I didn’t realize how easy the job was and how easy it was to get paid. When I finally joined the business, I didn’t realize how hard that was going to be. It was going to take time and experience. I felt like I was running out of time, and money, plus, I definitely didn’t have any experience. Here’s the best part: Apartment communities pay real estate agents top dollar for sending them tenants! I found a quicker and easier way to make money in real estate. It’s a shame that more agents don’t know how to do this. By the way, you won't need any additional licenses to be able to do everything I teach you. If you’re like me and you like instant gratification, this is for you because your results will be so quick, it will feel like it’s instant. My proven email templates that I actually use in my business. 2. Study and practice the course content at your own pace. You can go as slow or as quick as you want. 4. The course can be accessed from any device and at any time. 5. Download my scripts and marketing materials to use in your business. While we make every effort to ensure that we accurately represent all the products and services reviewed on this website and their potential for income, it should be noted that earnings and income statements made by ChastinJMiles.com, Industry Power Players Network, Rental Boss, Chastin J. Miles and its advertisers / sponsors are estimates only of what we think you can possibly earn. There is no guarantee that you will make these levels of income and you accept the risk that the earnings and income statements differ by individual. The use of our information, products and services should be based on your own due diligence and you agree that ChastinJMiles.com, Industry Power Players Network, Rental Boss, Chastin J. Miles, and the advertisers / sponsors of this website are not liable for any success or failure of your business that is directly or indirectly related to the purchase and use of our information, products and services reviewed or advertised on this website.